Drenched in agriculture and a riverine economy, taxis from the airport the first night splashed through Saigon’s festival of flower-market streets. 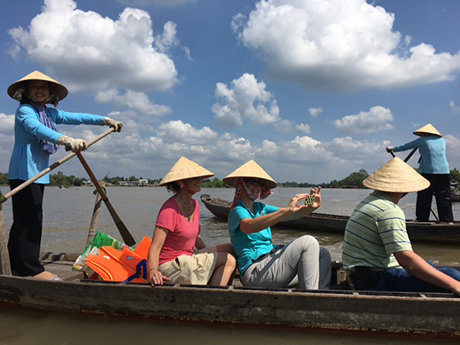 In the two-weeks to come, Class II paddled together through floating markets on the Mekong, its shimmering rice fields along the Han Noi road, river-side potteries, and pineapple gardens. It is a nation of bustle and building with cottage industries, small breezy factories, and fish-farms selling mounded buckets of cabbage in village markets. Can Tho University, the major university for the Mekong delta region, is set amidst the agriculture it supports. “This has been another amazing day of learning about how agriculture works in this country. It is very apparent that even though we are half a world away from home, many of the agriculture issues are very similar,” blogged, Adam Shiflett, VALOR fellow and Farm Credit manager from Harrisonburg. There is no meaning without context and every VALOR class is primed for its two-week international experience. Ten of the twelve experiential seminars take place across Virginia. Each two-day seminar includes state and regional tours, presentations, workshops, networking opportunities, and training hosted by leaders in agriculture. “VALOR is all about developing leaders who can effectively engage all segments of the agricultural community. That takes understanding how to create collaborative solutions – a multidimensional skill that VALOR’s experiential state, regional, and international experiences develop deeply,” said Megan Seibel, program director for VALOR. VALOR is currently accepting applications for Class III. This entry was posted in Past Issues and tagged VALOR. Bookmark the permalink.